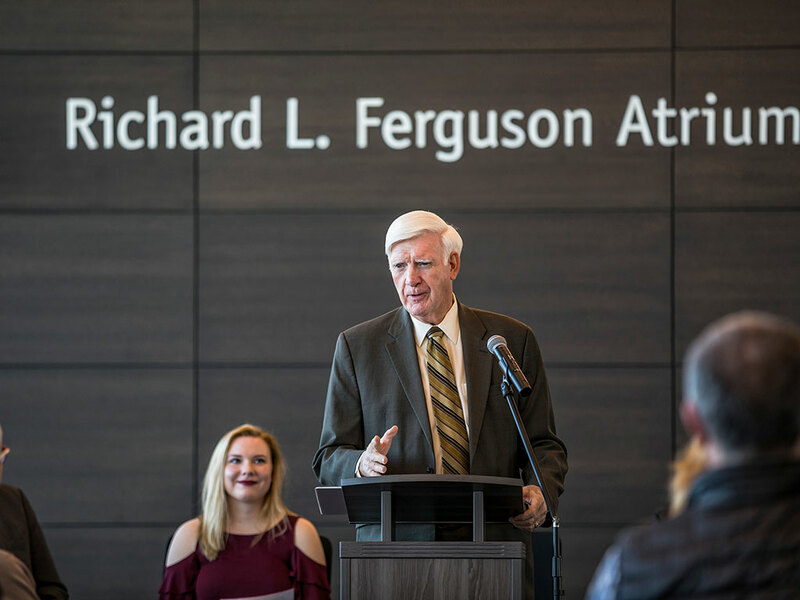 CORALVILLE, Iowa (Friday, March 9, 2018)-Kirkwood Community College dedicated the Richard L. Ferguson Atrium in a ceremony on Thursday, March 8, at the Kirkwood Regional Center at the University of Iowa in Coralville. Attended by college and community leaders, the event recognized the significant contributions to education made by Ferguson on both a local and national scale. As former CEO and chairman of ACT, Ferguson facilitated a $2 million gift in 2010 to start the ACT Endowed Scholarship at Kirkwood. The gift was the culmination of a long-time partnership between the college and the organization that continues today. To date, 151 ACT scholarships totaling more than $580,000 have been awarded in the last eight years. In addition to the scholarship, Ferguson’s commitment and passion for Kirkwood and its students has been evident for many years. He has served on the Kirkwood Foundation board since 2010 as well as serving as a member of the search committees for both the college’s next president and the new vice president of advancement. In 2015, Ferguson received the Samuel J Kirkwood Legacy Award to recognize a personal legacy gift. Today, he still continues to help Kirkwood students through his connections with several highly successful entrepreneurial educational businesses. Kirkwood President Mick Starcevich, who spoke at the event, said it was important for the college to recognize Ferguson’s big impact. The Kirkwood Regional Center at the University of Iowa, where the atrium is located, opened in 2015. The center is a model of innovation and entrepreneurialism, showcasing the partnership between Kirkwood and the University of Iowa. It was founded on strategic collaborations that connect educational and business resources to serve as a catalyst for college and career exploration, certification and degree attainment.